Earlier this year, I'd learned that Beatles-tribute band, The Fab Faux, ("We're not a COVER band; we're a TRIBUTE band! "), are doing shows based on The White Album. It didn't occur to me, for some reason, that the show might have something to do with the fact that The White Album turns 40 this year. Writing anything about The Beatles more than 40 years after they'd unknowingly cemented themselves a permanent place in every "best of..." list to be conceived by every music-based magazine or cable station is what some would call "needless" or "unnecessary." Countless novels, articles, criticism, documentaries...how many words have been spent repeating the same observations and coming up with same undeniable conclusions? Like the stars? Generations of musicians are born under the unfortunate and futile circumstance of never being able to live up to a band that had its day more than 40 years ago. What must that feel like: To know that you'll never live up to four working class kids that were completely unaware of the impact that they would have? Well, now I'm spending MY words, discussing The White Album and my take on it because I guess I'm into being redundant. Plus, it's an important album to me, basically because I consider it to be the TRUE anti-Beatles record, more so than Sgt. Pepper had initially set out to be. It's the mark of a dissatisfied unit that was bound together by its obvious success, but comprised of elements (3 at least) that wanted to make their own individual marks. The White Album, to me, is like the world's first mixtape. I think I was 10 or 11 when I'd first really dropped the needle on my Dad's crackling and overplayed copy and gave it a real listen. Up to this point, I was going through my Dad's Beatles collection chronologically, exhausting records before I'd move onto the next thing. Magical Mystery Tour, which is easily in my top 3, had been spun way too many times thanks to an obsession with "I Am The Walrus." I even watched the movie. I hated it, but I endured it. The faint and familiar airplane whistle was barely audible before The Beach Boys-infused surf rhythm of "Back In The USSR" began and it was already obvious that experimentation had been thrown out the window. It was back to Rock N' Roll. At the time, I didn't know the occurrences or events that led to the making of the album, and I didn't really care. When "Dear Prudence" came on, I had a new favorite Beatles song. I think I wound up replaying that one over and over, almost-tearfully drawn to Paul McCartney's prominent and jumping bass line and John Lennon's mournful tonality. That song is absolute perfection and, more than twenty years later, it still chills my skin. Listening to the album now, it really does sum up the best and worst of what The Beatles were/are capable of. The most sentimental and cheesy aspects of McCartney's art was rearing its ugly head in the form of "Ob-La-Di, Ob-La-Da" and "Martha My Dear." Lennon was accessing a rather morbid sense of humor ("The Continuing Story Of Bungalow Bill") and coupling that with an attraction to blues and political folk ("Yer Blues," "I'm So Tired," "Revolution 1"). And, George Harrison, probably because there were two LPs to fill, managed to contribute more than just one or two tracks with the Clapton-aided "While My Guitar Gently Weeps," the satirical and overtly British "Piggies," the quiet "Long, Long, Long" and Poppy but forgettable "Savoy Truffle." The album is so 50/50 in terms of quality, it's the type of thing that begs for attention simply because it shouldn't work. But, somehow, it does. Dysfunction rules if a song like "Helter Skelter" can be its theme music and I only say this because, as the songs have aged in my head, it's really easy to sift through the dirt to find the gems. "Wild Honey Pie," for instance, doesn't really count as a track, but I love it anyway. "Rocky Raccoon" has lost its novelty, but I still sing along whenever it comes on. "Don't Pass Me By," one of the TWO Ringo Starr mistakes included, isn't my favorite thing on Earth, but I never skip it. Even Yoko Ono's "Revolution 9" has gained SOME appreciation from me even if it was nothing more than Lennon's attempt to appeal to the artist set. 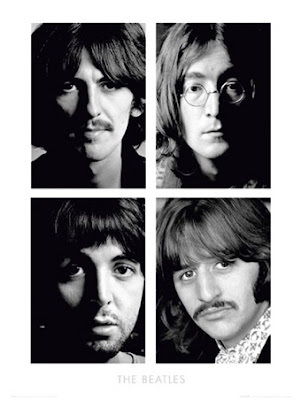 But, the mature and raw Rock fury of "Happiness Is A Warm Gun," the rhythmic melancholy of "Cry, Baby, Cry," the soft and sweet "Blackbird"...for all the mistakes The White Album commits, The Beatles were never so honest as they are here. Through their lack of cohesion, they still connected with their fans on a new level, hinting at their individual abilities and sort of making a case for their eventual demise. The album basically requests emancipation and cites irreconcilable differences. Is it any coincidence that their most honest album is so simply titled, The Beatles? Was it just an accident that their simple and flat album cover could easily speak of "clean slates," "starting from scratch," "blankness?" 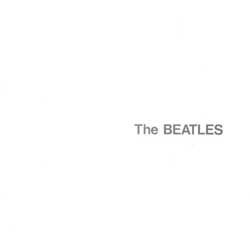 In its own way, The White Album may have the most brilliant album cover ever designed as it is the most frank and straightforward explanation for a band at its end. It speaks volumes while saying NOTHING. The absence of light, color, inspiration...it's the perfect testimony from a band that no longer felt magic or excitement. It's unfortunate that that honesty only spoke of a need to disband and move on, but at least there was one more masterpiece in them before they called it quits. As dysfunctional families go, it would be a better world if they all sounded this good. And here we have some more words spent on an ever-adored and perfect entity. We love you, Beatles. Oh, yes, we do.